Only two HDMI ports for HDR compatible. 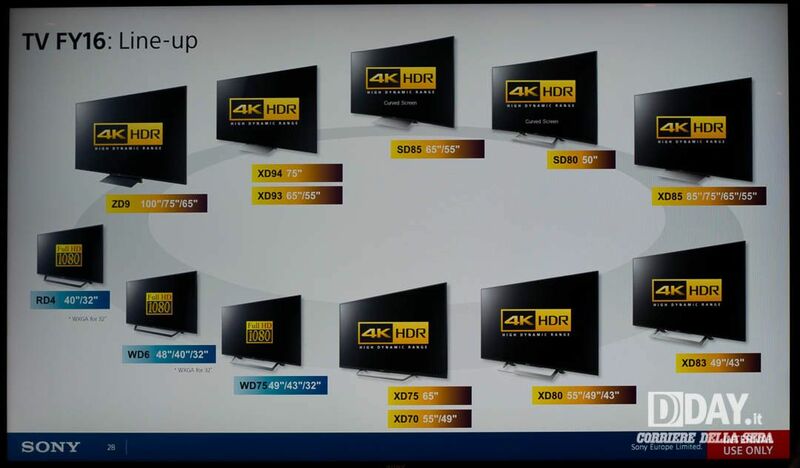 HEVC/VP9 10-bit color with HDR, up to 4K UHD 60 fps. This is suitable for internet TS/IPTV streams, Netflix or YouTube. Meanwhile worldwide demodulation capabilities include ATSC / DVB / DTMB / ISDBT. with [MotionFlow] "Clear & Custom"
but no CMS (Color Management System) to calibrate these gamuts. There is also adjusting the gamma, black level adjustment, contrast and backlight. The Pro Cinema mode is still the cheapest cardboard output with colorimetry with Delta E average of 1.93, but differences can mount a delta E of 3 in the last gray levels. It can therefore be used like that, without calibration, but for the more demanding it is still advisable to have provided an effective probe, because with so few differences, a cheap probe could do more harm than good. The display also supports HDR10 open-source standard out of the box, with accurate PQ tonemapping (from 4K Blu-ray) and a peak brightness surpassing 1000 nits. In the Japanese TV maker’s pursuit of ultra-slim aesthetics however, backlight uniformity seemed to have taken a hit: 65XD9305 review sample suffered from flashlighting from all four corners of the screen, although there’s always a chance that other units in the wild may fare better. The Sony XD93 suffers quite marked light leakage in the 4 corners of the slab that degrade color uniformity and the perceived contrast. Twitch gamers will also be disappointed to learn that input lag has increased by 16ms (i.e. one frame) from last year’s Sony Bravia Ultra HD models. As for the UHD upscaling XD93 is simply the best of the market, above the TV Panasonic, LG, Samsung and others. If I had made reservations at the launch of the 2015 range, meanwhile, Sony proposed updates that have greatly improved the quality of upscaling and sharpness of the image. The upscaling offers a very natural, with a rich texture and an image with a dive with great precision. The multimedia part is much too unstable and unusable for my hand by the simple fact that the videos are stretched, distorted and that the demosaicing is not correct. + Simple calibration, fast and efficient! - Still too many bugs with Android TV (videos stretched in multimedia playback, frequent reboot, frequent losses HDMI signal with devices HDCP 1.1, remote control does not respond fairly regularly, concern for synchronizing 3D glasses, saccades with KODI, no bitstream audio with 5.1 KODI, bad die-stamping with videos played via USB / DLNA, HDR mode losses in multimedia playback, etc. There is no visible difference! ,KD-XD8505B (black) ,KD-XD8577S (silver) , ,KD-XD8588B (black) ,KD-XD8599B (black). What differences between references XD8505, XD8577 and XD8599? Let me be clear: no! This is simply references marketed only to please some signs that make large volumes of sales, so they do not suffer from competition on the Internet. You will probably see a little difference, often on the index of fluidity XR1000 instead of XR800, but these are purely marketing indices. There is no visible difference between a Motionflow XR800 and XR1000. ACE (Advanced Contrast Enhancer), the famous setting "Improvement of Advanced Contrast" could be compared to a very efficient dynamic contrast. Still, I always advise to disable dynamic contrasts, but that ACE is not like the others. Note that I do not say it is faultless, but it brings so many dynamics of the image on an IPS panel that is difficult to do without. Moreover, it enables up to 1200: 1 ANSI contrast. Its main strength is that it can offer a hyper dynamic image, without clogging the black (it is the opposite, it opens totally black and greatly improves readability in dark scenes). In lit room or in daylight, the illusion is so perfect, you'd swear that this TV has a contrast very powerful, even more powerful than some VA panels. Better, this ACE is devilishly effective with UHD Blu-ray because it totally transforms HDR rendering. No, the HDR seems bland, uninteresting and bridled, while if it is active, HDR rendering is very nice. Indeed, despite a very limited coverage Rec.2020, the XD85 offers one of the best colorimetric market through its IPS panel and its algorithm Triluminos remastered colors in Wide Gamut very effectively maintaining a natural. Only the DX900 who offered me a better colorimetry thanks to its LED red phosphorus that help provide intense red that IPS while retaining the advantages of a VA panel. In addition, Sony XD85 offers colorimetry very fair cardboard output and angles very open visions that allow the whole family to enjoy a good image regardless of his place on the couch. However, this TV is clearly not recommended for those who watch their movies in dark room. Besides, if you watch your movies in darkened room, there is absolutely no reason to buy the XD85, since the X85C offers exactly the same functionality, but with a VA panel and a very good contrast. True, the colors will be slightly less beautiful but dark room contrast is still paramount. The Sony XD85 is limited to enjoy the UHD Blu-ray, with a slab 8 bit HDR rendering flanged (bright peak at 425 cd / m², whatever the size of the target HDR), but again, the ACE saves setting and can offer an ultra dynamic image, very pleasant to look lit room. Nevertheless, the IPS puts his HDR limits with enough gray black, which can amount to more than 0.30 cd / m² at the brightest images, so again, you better watch Blu-ray UHD illuminated room . + The ACE (Advanced Improvement Contarstes) boosts the dynamics, especially in HDR. Този пост е редактиран от hristoslav2; 21-08-16 в 09:57. Този пост е редактиран от nikko83; 19-08-16 в 23:36. Вчера си поръчах активни очила модел TDG-BR250, днес идват и изобщо не ги намира телевизора,който е KDL50W808.В сайта на техномаркет пише ,че очилата са съвместими с всички телевизори Бравиа.Дайте съвет какво да правя? Виж първо в настройките на тв дали е включен блутуута. Тези очила не стават за този телевизор трябва да са от „500“нагоре за да работят ако не се лъжа. Току що тествах на един приятел TDG-BT400A,и с тях няма проблем. По назад в темата един от колегите обясни как да се модне приложението така че да става за телевизор. TDG-BT400A и TDG-BT500A - буквата T показва че връзката е по блутут. италианският журналист твърди че са му показали парче от подсветката с размер 20х30 сантиметра. От видяното на око, той твърди, че светодиодите са на разстоние от 1,5 см един от друг. Този пост е редактиран от hristoslav2; 20-08-16 в 20:41. Този пост е редактиран от hristoslav2; 20-08-16 в 22:27. Значи не стават за моя телевизор? Моят съвет е, да не си даваш парите за глупости. 3Д бързо ще ти омръзне и очилата само ще събират прах в чекмеджето. Ясно,мерси! На някой да му трябват SONY TDG-BR250? ST2086 (static metadata), ST2094 (dynamic metadata). 1920 x 1080 / 120Hz - ?? Този пост е редактиран от hristoslav2; 27-08-16 в 12:05. Да напомня - не знаем, режима и настройките на картината в моделите за сравнение. Този пост е редактиран от hristoslav2; 24-08-16 в 12:44. Избор на климатик 2016 г.